I have two monitors and Windows 7. Is it possible to tell Steam to open a game on my second monitor instead of the main monitor? If that's not possible through Steam itself, is there some other way for me to control what monitor a particular game starts on? Switching to windowed mode and dragging the game over isn't always an option and I'm looking for a more robust solution. With Steam's Big Picture mode you can now choose on which monitor games should be running from the settings menu in BP. Also very handy if you're playing in stereo 3D, since that also only works if the display used is the primary one. 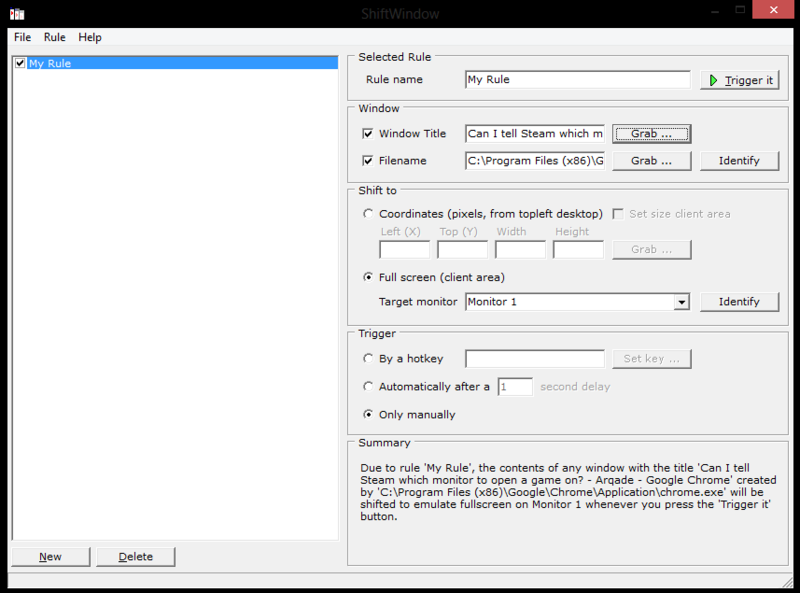 Looks like there's a piece of software called Gamers Window Relocator that allows you to effectively do a -noborder (to do "fake fullscreen") on any game. There is also How to force Maximized Fullscreen mode in any game?. With the game technically in windowed mode, you should be able to alter what monitor it is displaying on fairly easily (and possibly even use multiple monitor keyboard shortcuts and the like). I know this is a little late, but if anyone else pops in here is my two pence worth. All i do is switch my second monitor to the main display before starting the game then switch it back after I have finished. That way the game opens on my TV which is the usual second monitor. Other than that I'd suggest looking at each game in particular as some will have options you can set in game. If the game will run in windowed mode (borderless or not), you can use ShiftWindow to manipulate the window. You can resize it to fill any of your screens, many of your screens and fit it so the borders aren't visible even if they're really there. You can also save and load presets, if you wish to use different window sizes or monitors for different games. Another advantage is that this program will work with any window, it doesn't have to be a game. I mainly use it to get my League of Legends window back to my desktop after it has run off to oblivion. When the game is first starting, press shift+WinKey and then an arrow key left or right. It'll move the window to the adjacent monitor. You have to do it every time the game starts, but it works perfectly for me. Ultramon is excellent for this. You can edit the properties of the shortcut where you can select which monitor the game/app will play on. 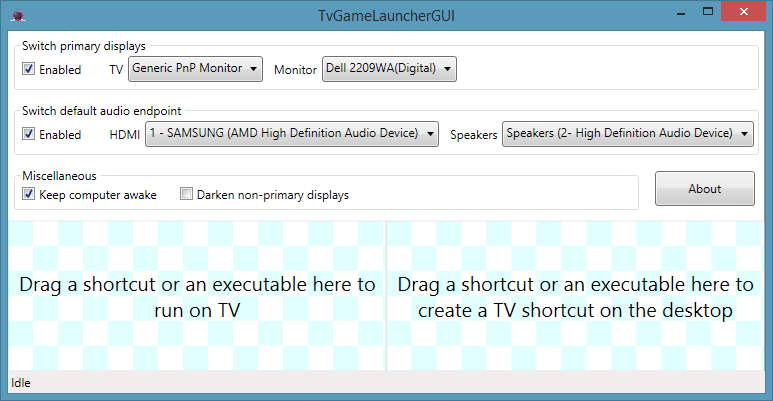 Also you can have other monitors turn off for you and then back on once the game/app exits. It is worth the money to buy it. Additional: Does not work with steam. However, with Ultrmon, you can create shortcuts to turn off other monitors. So I have a shortcut to go to GamingMode. The game has no choice other than to open on the one remaining monitor. After playing I execute the DefaultView shortcut and my other monitors turn back on. Steam now does this, check on settings. Big Picture, Settings, Display, Target Monitor. There you have it. How to move a fullscreen game to the second monitor? How do I launch Skyrim in fullscreen mode on a secondary monitor? Is it possible to play Civ 6 or BE on a Secondary Monitor? How do I start Fallout 4 on my Primary Monitor? How can I move Morrowind in windowed mode on Windows 7? Why are my attempts to take in-game screenshots (in Big-Picture mode) failing?